The first “Farmer Entrepreneurship Relay Baton" project in Shandong was launched in Linqu county in Yimeng mountain areas, Huai Fang City. Recommended by Provincial Forestry Department, volunteers visited the project area several times and 20 peasant households will be engaged in "longevity food" hawthorn planting. The twenty–fifth Relay Baton project was launched in Shucheng county, Lu'an city in the Dabie Mountains, Anhui province. Recommended by Provincial Agriculture Commission, tracked by project volunteers in all the process of the project, 20 farmer households will be engaged in the high economic value, ecological pollution-free rice planting with ducks catching insects in the paddy fields. Received the relay baton from project households who were engaged in sericulture, eight farmers began the pitaya project. Farmer Lu Weiming resolutely quits his migrant work and hopes to live a happy life together with his family. The phase 2 of the first relay baton project in Guizhou was launched in Zhengan county, Zunyi city. The square bamboo farmers of phase 1 became rich through their hard work and they paid back their bills on time and passed the relay baton to sixteen farmers of phase 2. Rare things that absorb and grow from nature's nimbus, square bamboo shoots can bring a good life to the new relay baton farmers. Organic rice paddy field preparations and transplanting rice seedlings have basically been completed. The cooperative organized agricultural machinery hand skills competition and the relay baton farmers can participate in the competition to learn the skill. Han Longsheng (left) and Han Zude (right) have expanded their circulation areas of 210 mu and 290 mu this year, and they feel relieved to start their own business at home. Relay baton farmers’ tea planting survival rate accounts for more than 95%. It is at the nursing care stage now. Right above photo: a discussion between Volunteers and project households had a discussion, talking about the promising future. The main work of the cooperative this quarter is to provide baby chicks and recycling commodity chicken. Left above photo: Tricycle bought by farmers Shi Jinyu and Wu Kaicheng. Kiwi fruits are in process of growing. Project households are mainly thinning flowers and fruits and application of strong fruit fertilizer. Left above photo: volunteers paid a return visit and had a chat with farmers. Longjing tea is growing well and farmers are in high spirit. Left above photo: the tea farmers interplant pepper in the tea land. Right above photo: The technicians of the agricultural department guide the project households to prevent and control plant diseases and insect pests. The relay baton farmers began harvesting and selling summer mushroom smoothly. The farmers’ greenhouses increased from the original 10 to 46. Cultivated lentinus edodes was listed as the leading industry in Sandu county. 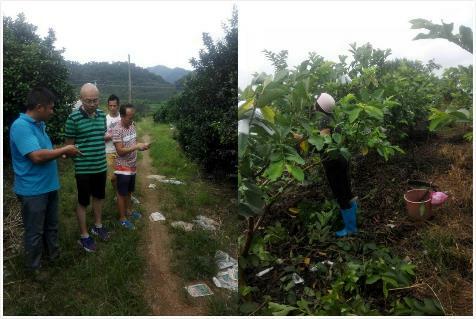 According to the plan, apple peach project farmers carried out weeding in the fruit plantation, topdressing, summer pruning and plant disease and insect pest prevention and control work. 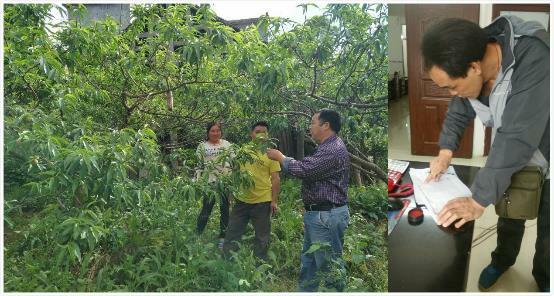 Right above photo: The cooperative director is talking to project farmers Liu Qianfen and Zhu Nengzhen to help them to solve problems in planting apple peaches. The project households participated in the restoration of water channels and weeding work, and the bottle seedings of Dendrobium candidum were already flowering. It is the blooming season for grapes in April, and the farmers are busy with artificial flowers, weeding, fertilization, watering, cutting seedlings. In June, farmers will bag grapes waiting mature, looking forward to the summer harvest. Guava harvests and farmers are busy with bagging guava. Left above photo: The cooperative director is giving technical guidance for project farmers. Guangxi pearl plum project farmer Zhang Yuan and his family members planted 10 mu of pearl plum for 3 years with careful management and protection. Project households have sprayed pesticide and spread manure and fruit trees are growing well. Above photo: The cooperative director gives technical guidance for fruit planting, as well as the farmer receives materials provided by the cooperative. Li Changgui once worked in Dongxing, Guangxi province is now a fish farmer. 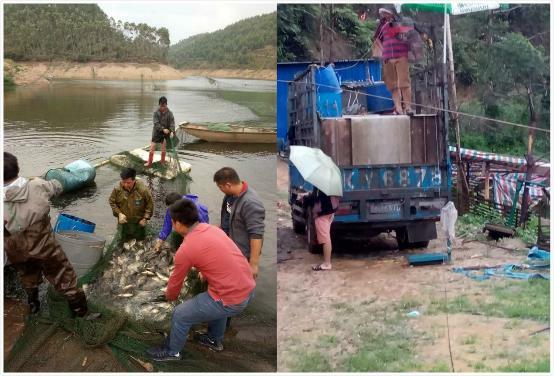 Since he joined the relay baton project, his income of farmed tilapia has doubled the income of a migrant worker. In the second quarter，he sell fish and released fish fry with reasonable price. The cooperatives carry out training on fish breeding and disease prevention for the project farmers. Organic vegetable project farmers sell beans, sweet corn, tomato, pepper and other summer vegetables. 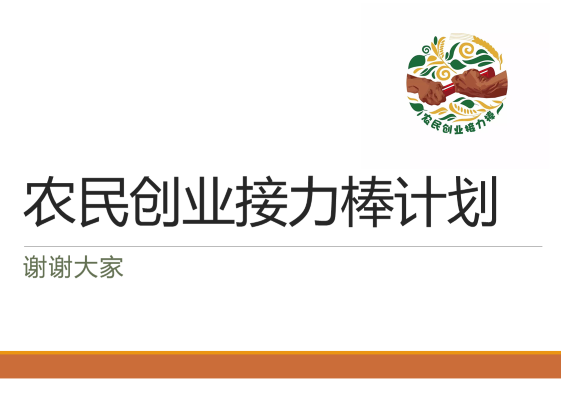 Under the warranty of the cooperatives, four project households got 30 – 50 thousand loans from Chengdu Rural Commercial Bank. 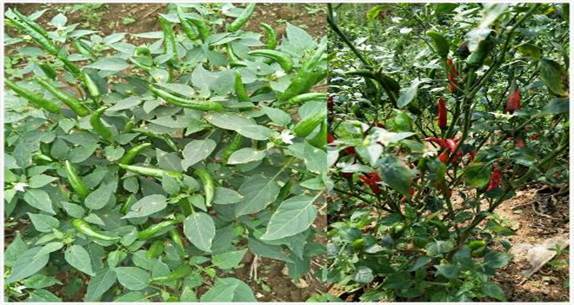 The farmers are busy working in the growing stage of hot peppers, part of which has been red. The harvest is upcoming soon. In support of relay baton project, farmers Zhang Yi and Gao Shuzhen expanded 200 mu of Kiwi fruit trees. Kiwi flowers were in blossom on April 18 when the plantation management entered the busiest season: artificial pollination, thinning fruits and bagging fruits. Kiwi fruits are growing well. Left above photo: Bai Mei, technician, guided project farmer Bo Xuezhi’s son how to box bees and manage the site. The cooperatives ordered 60 boxes of bees. The second quarter of the year is bees breeding season. The number of bees raised by the project households increased 50% over the same period last year. Above photo: Project household Chen Jinlian are selling watermelons. Since she participated in the relay baton project, she can stay at home to take care of his son who has been successfully admitted by Fenyi No. 1 middle school. Chen Jinlian used watermelon sales revenue to buy sofa and tea table to create a better family environment.